AURORA WEST IS NUMBER 6 ON THE NY TIMES BESTSELLERS LIST! Paul Pope’s graphic novel THE RISE OF AURORA WEST enters the New York Times PB GN Best-Seller List for the week of Octobr 19 at Number 6. 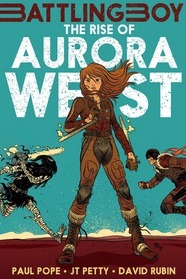 AURORA WEST is a prequel to Pope’s bestselling BATTLING BOY series. Next Post RELISH is out in Italy now!